You will earn 2,785 Reward Points. Earn 1 reward point for every 1 dollar spent. Heat Plates Evenly and Faster With Greater Efficiency. Mobile Cabinet: Mobile cabinets shall be of all-welded stainless steel construction. Cabinets shall have 18-gauge top and 20-gauge sides and bottom and shall include bottom corner bumpers. Cabinet bottom shall have center clean out hole. Cabinet sides and top shall be double-wall to provide heat retention and energy efficiency. Casters shall be 4” (102 mm) diameter non-marking swivel (two with brake). Unit shall feature a heavy-duty independent undercarriage frame of galvanized steel to which casters shall be mounted. Two each stainless steel heat retaining dish covers shall be included. Units shall be NSF and UL listed. Dispenser Tubes: Dispenser tubes shall be of welded stainless steel construction and shall drop into mobile cabinet top openings and feature open side design to allow flow of heated forced air to dishes. Dispensers shall hang from cabinet opening by an 18-gauge flange ring, and feature three each 22-gauge vertical side supports welded to 20- gauge bottom plate. Self-leveling dish carriage shall be of welded stainless steel construction and shall travel vertically in dispenser tube with nylon guides for smooth operation. Carriage shall have 22-gauge removable dish platform. 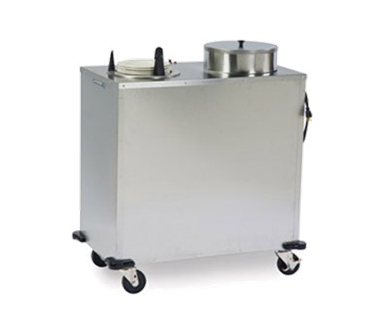 Dispensers shall feature flange-mounted perimeter extension springs, which are detachable from the dish carriage, to provide tension adjustment without tools for different weight dishes. Adjust-a-fit® model dispensers shall feature a diameter adjustment range of 3 1/4”. Each dispenser shall have a vertical stacking capacity of 25” (635 mm). Heating System: Unit shall be 120 VAC 60 Hz, 6.5 amp and shall have a 7’ (2134 mm) SOOW power supply cord with 5-15P NEMA plug for 120 VAC. Cabinet shall have interior mounted 235CFM Class F convection fan to distribute heat evenly inside the cabinet. Heat shall be provided by a single 750 watt Incoloy® heating element. The heating system shall feature a single on/off switch with power indicator light and thermostatic control knob for the heater element and fan. Unit shall be capable of heating dishes up to 150º F evenly in 90 minutes.